I've put you into a new window. To return to the other page, just close this window. Leon Class lunch on July 3, 2009 at A La Provence. Photo from Ann Dart. Front row: Shirley Gilmer Moore, Gloria Hancock Maddox, Ann Dart, Lee Lee Cobb Arnold, Karen Moore Baughman. 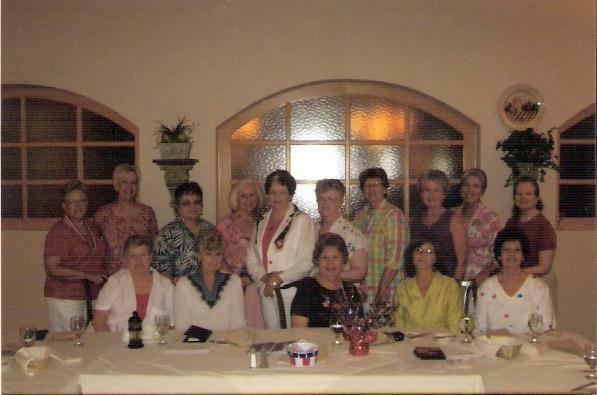 Back row: Ida Sue Phillips Chambliss, Carol Tyler Bowers, Sandy Stabler Cotner, Marsha Cantrell, Susan Yancey Perkins, Rosalind Bigham Ekermeyer, Nancy Keith Wheaton, Frances Harrison Dennard, Linda Johnson Smith, Judy Thompson Goodwin.